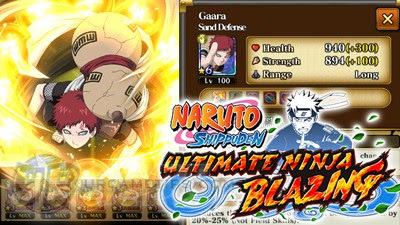 Here's a guide on how to level up your ninjas fast in the RPG Android and iOS mobile game: NARUTO: Ultimate Ninja Blazing. This section will cover the best ways to boost your ninjas by farming Ramen, Awakening materials, and more. - Only use 1* Ramen until you are able to farm Ramen Cup [B] stages. - For below Lvl 50 ninjas, use 2* Ramen. - For Lvl 50+ ninjas use 3* Ramen (as much as possible, use same element). - With the new update, you can now get 1* and 2* Ramen from Friend Point Summons. - The most basic way is by farming Ramen from the daily Emergency Missions - Ramen Cup [C] or [B] early game. - Once you have a Lvl 30 or higher ninja with a suitable element for the current mission, you may now start farming from Ramen Cup [B] using the "Gather Friends" option. - Since you are the host, you can choose any ninjas you like as your Helpers, preferably high Lvl ones with an element that can mitigate the damages of your enemies. - At least 1 healer for the team would also be great, to ensure the survival of the team and complete the stage with ease. - Your aim is to farm Ramen, only consider the condition rewards if your team is strong enough. - Avoid getting mobbed or running through 3 or more enemies, especially when facing tough Bosses because their combo attacks can truly hurt!, unless you are absolutely sure that you can tank their damages. - This is the most common reason why missions fail, so it is best to eliminate weaker enemies first before taking on strong bosses. Always remember that element countering and positioning are the keys to a swift victory. - Only farm here once you have a stronger team, use 2 healers if necessary. - Multiplayer Mode is a feature where players can join in missions without the need of spending Stamina. You can't get any EXP and Ryo, or even complete the conditions of the stage is you are a "Helper". - The only items that you'll be able to gather are those that can be dropped by enemies in battle, like Ramen! - To play, go to: Emergency Missions >> Ramen Cup [B] >> then select "Join This Mission in Multiplayer". - This one depends on the current mission and preference of the host. You can check their comment below the mission request window for more info. - Follow the element recommended for that mission (Note: Wisdom and Bravery are optional since they are both weak and strong against each other), or just use your 2 best ninjas. - Most teams would also welcome Healers, especially when they are decently upgraded. Use one as your Front, or Back buddy for your high attack ninja. - Example: Based from experience, using 1 Kabuto or any decent healer and 1 offensive type ninja will likely get accepted. Note: With the new update, Luck will also now affect Lucky Drops, so hosts will also require any high Luck ninja as Captain, then a healer or offensive type ninja as Buddy. - Other Note: Ninjas that can tank or do perfect dodges are great versus most enemies, while Control skills like immobilize or similar skill, can really help against bosses. - This method is easier and faster because you can only view all available missions under Ramen Cup [B]. If you can't find a mission, just keep spamming the "Update" button. - Other players are probably using this method too, so better be quick! - If you keep getting the "disconnected from the host" message, just try other ninjas, or transfer to Ramen Cup [C] and level up your ninjas more. - Same method applies, but this time enter those limited time "Getting Rich Quick" emergency missions. They usually appear after the server reset (new day in-game) for 3 hours, and during weekends. - Note that your ninjas' LUCK affects drop rates! Refer here for more info: Farming with High Luck. - You can also get them from Friend Point Summons. - Release these items to sell for Ryo. - The Awaken feature is where you can upgrade your ninja's number of "Stars", and in-order to do this, your ninja must reach their MAX Lvl and gather the required number of scrolls. - #3: Most ninjas will get increased proc rate or damage output on their Skills or Ninjutsu. - #4: Ninjas that can be Awakened to 6* will be able to unlock their Secret Technique. - Note that some selected event based 5* ninjas can only be awakened to 6* by farming their special items from their specific limited time Emergency Missions (only drops from Rank [A] stage). 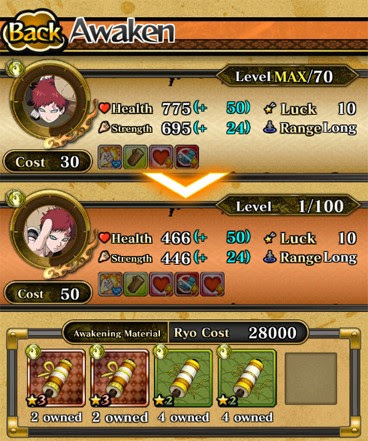 - Example: You need to farm the Special Awakening Tool: "Training Weights" in order to awaken Rock Lee ~ The Eight Gates. - By using all the methods above, you should be able to quickly level up and max out a 6* ninja to Lvl 100 within 1 day, and getting accepted from Multiplayer Missions should't be a problem anymore since you now have some powerful ninjas in your command.